Press the top/spacer into the shell. Bond the top/spacer to the shell with a solvent applied to the inner seam. Place the electronic assembly onto the mounting posts. Snap the back piece on. The core parts are all generated by a Python script run inside Rhino 3D. That makes it easy to tweak the design. 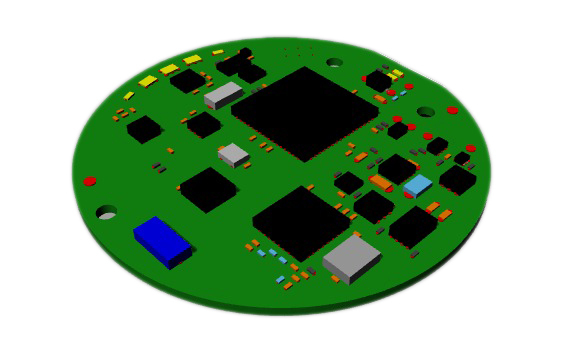 Having a 3D model of a PCBA can be very useful when designing a small enclosure with small clearances. To help with this I've written a small Objective-C program to read the Eagle CAD PCB board file and generate a Rhino 3D Python script to create a 3D model of the board. This makes it easy to check an enclosure design. Place the 3D board model into your 3D enclosure and visually check for alignment, clearances, etc. You can also do boolean operations to check for any interferences and see their exact shape. 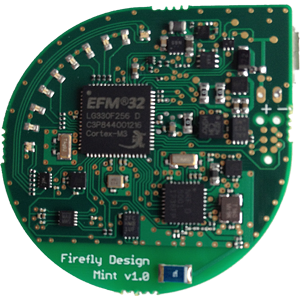 The code is available in the Pcb-To-3D directory of the firefly-production-tools repository on GitHub. When doing low volume builds, it is important to be able to track availability of parts and pricing. It is often difficult to find all of the required parts from the same distributor. Parts go in and out of stock leaving the need to check other sources. A design may have a number of assembly variants (different ways to populate the PCB with parts) depending on what features are needed for a particular build. Determining the price and availability can be a time consuming process. The BOM tool reads an Eagle schematic and creates a part list. Attributes in the schematic are used to specify the manufacturers part number. Optional attributes can be specified on parts in the schematic to describe different assembly variants. The BOM tool uses the Octopart API to find distributor pricing and availability for all of the parts. The assembly variants and distributors that carry the parts are shown and can be individually selected. A pricing and availability information summary is shown and a detailed report for each quantity is saved. 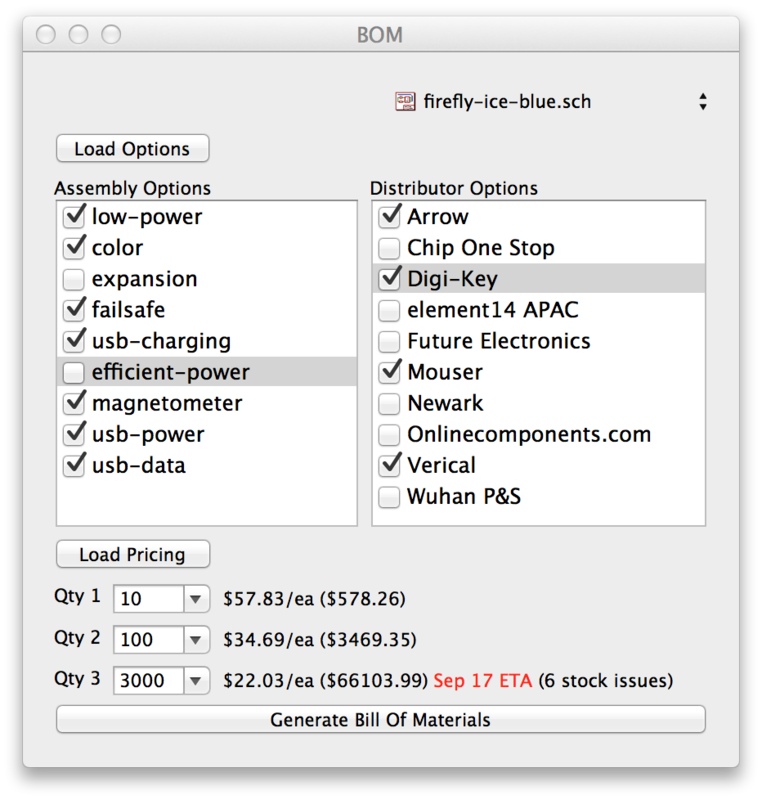 With this tool, it is now possible to easily estimate prices and lead times at various volumes for Firefly Ice Blue. The next revision of the Firefly Ice hardware, called Firefly Ice Blue, is now on github in the repository firefly-ice-electronics. 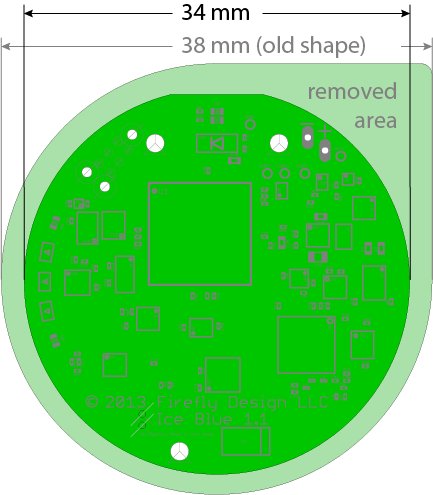 Completely round PCB with a smaller diameter of 34 mm. New RGB LED controller provides full color control. External flash storage has been increased to 2 MB. I2C connector to support external circuitry. Design tweaks in support of very low sleep currents. Mounting holes on either side of the USB connector and on the opposite end of the board. A small prototype PCBA run has been started and should be ready in early July. This design that will go into production this year. I've switched gears to focus on the mechanical design of the enclosure. More information on that will be coming soon. If you are interested in purchasing Firefly Ice Blue PCBAs and/or complete Firefly Ice Blue devices please get in touch. The first power measurements for the Firefly Ice prototype PCBA look really good. Very low power means small batteries can be used while still getting great battery life. Average power consumption for the PCBA with the real time clock and watchdog timer running (everything else in sleep mode) was measured at 2.7uA. Average power consumption for the PCBA with the real time clock, watchdog timer, and accelerometer running (everything else in sleep mode) was measured at 6.0uA. The accelerometer was running at 25Hz in low power mode. A CR2032 240mAh coin cell battery would last 4.5 years. A 40mAh rechargeable lithium polymer battery would last 9 months. 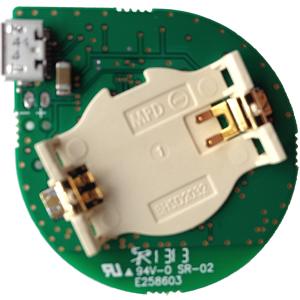 Of course a typical application will need to use other devices on the PCBA, such as the Bluetooth 4.0 low energy radio, LEDs, CPU, etc. Consider a simple activity monitoring scenario. The radio sleeps 90% of the time, is in discovery mode 5% of the time, and connected 5% of the time, adding 2.4uA. The CPU usage averages 10,000 instructions per second adding 2.8uA. Two LEDs are illuminated for 30 seconds a day adding 3.5uA. 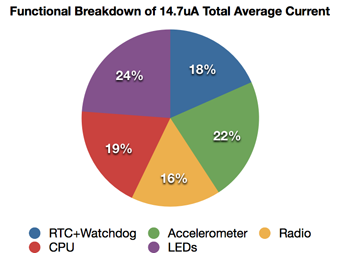 This along with the CPU and accelerometer usage of 6.0uA, brings the total average current to 14.7uA. The CR2032 battery would last about 1.8 years and the 40mAh battery would last about 3.5 months. 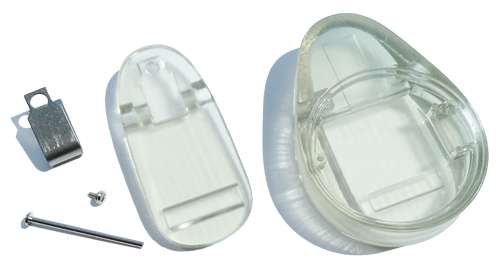 Two of the primary design challenges for body worn sensors are size and battery life. Those are opposing forces - smaller size means smaller batteries and lower battery life. One of the keys to a good design is to find the right balance for your application. For certain applications where the duty cycles are low it is certainly possible, with a good design, to have a very low overall average current which enables long life when using small batteries. The resulting FireflyIce.elf binary file can be found in the bin directory. Connect everything together, plug the USB cable from the ARM-USB-TINY-H into your Mac, and plug the USB cable from the Firefly Ice into any USB port for power. The Firefly Flash production software will be used to load the compiled FireflyIce.elf binary into the Firefly Ice PCBA. Download and run FireflyFlash.zip (it should automatically unzip when downloaded by Safari). Click on "Select firmware ELF file..." and select the FireflyIce.elf file that you compiled in the steps above. 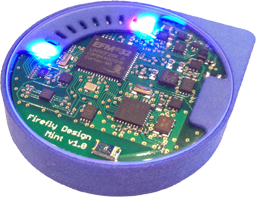 Click "Program" and in a few seconds the indicators on the Firefly Ice should indicate that the firmware is running. Now you can use gdb commands for debugging. The process above is one way to build, run, and debug Firefly Ice. But it isn't the only option. 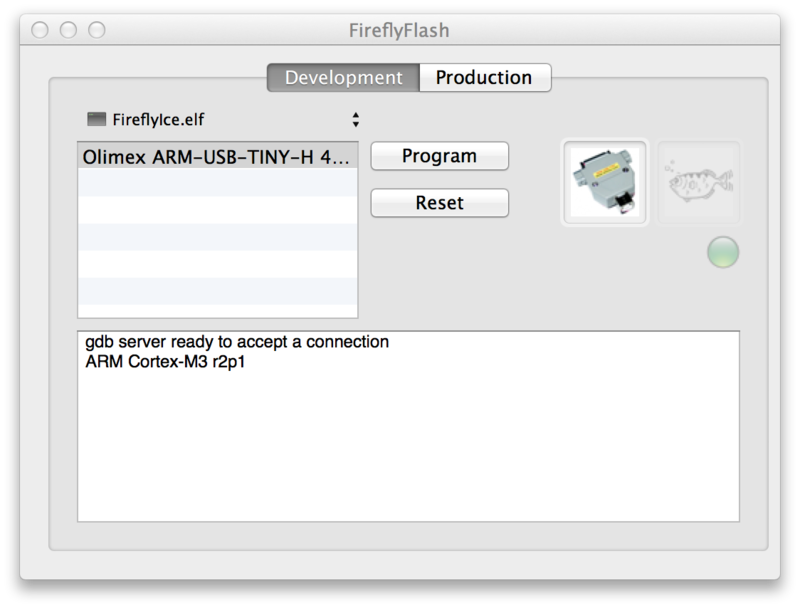 For example, a project file for the Rowley Associates CrossWorks for ARM development system is included in the Firefly Ice firmware repository as well. CrossWorks runs on Windows, Linux, and the Mac. Any ARM Cortex-M3 gcc distribution could be used for compiling. 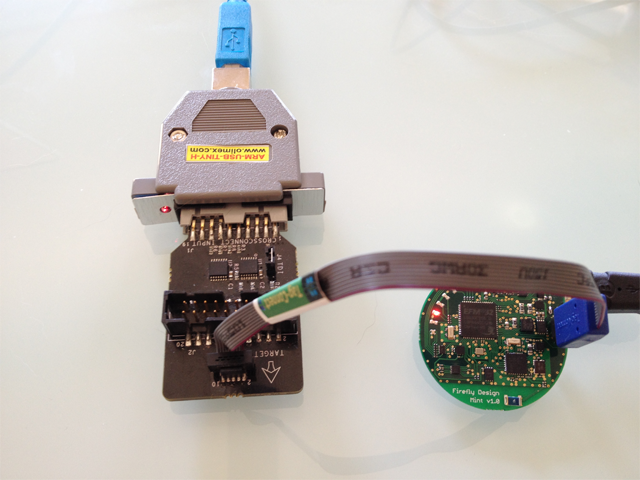 Any JTAG with SWD capability and the associated tool chain could be used for running and debugging. For example, the Olimex ARM-JTAG-SWD in combination with the Olimex ARM-JTAG-20-10 can be used instead of the Rowley ARM SWD Adapter with the same tool chain as above. The firmware to read the sensors and communicate via Bluetooth Low Energy & USB is working. Development of cloud data storage and syncing has started. 3D printed enclosure prototypes have arrived. I'm presenting this project at the Austin Hardware Startup Meetup. Source Code Repositories: Below are links to all of the current source code repositories for the software, firmware, hardware, and enclosure. Eagle schematics & printed circuit board layout files. The schematics have annotations that can be used to generate BOMs for ordering parts and for assembly. The printed circuit board layout has layers for documentation of assembly locations of all BOM parts. Note that the current schematics are for the first build of 10 prototype PCBAs. There will be some changes based on testing and tuning done with those prototype PCBAs. 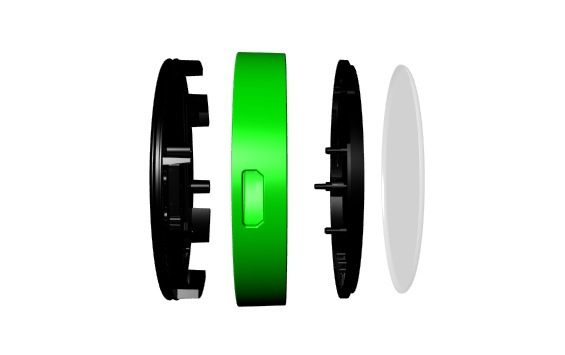 The Rhino 3D file has all the development enclosure parts as well as some other parts used as reference such as the cover pate, battery, screws, etc. The Shapeways files are printable STLs of the main body of the enclosure as well as the battery cover. The cover plate, screws, etc, are standard parts that need to be ordered separately. The first Firefly Ice PCBA arrived May 29th. So far the communication between all the chips on the board have checked out fine. Still more testing to do, but things look really good. The remaining PCBAs from this first build of 10 should be here this week. Effort is now shifting to focus on the firmware development.